This far into March and we’re waiting on freight delayed by snow still, what gives? Parts of the country are getting another dusting while other parts are getting out on the water one day and shoveling snow the next. In this topsy turvy weather it’s really easy to neglect getting the necessary spring maintenance done on your outboard or boat. We’re always staying busy here at the shop, and we are definitely seeing guides and other private owners getting their service done but, some of you will wait until summer is in full swing before you decide to get it sorted. The easy answer is don’t wait until summer! When summer rolls into the great NW it’s a mad dash to cram as much Vitamin-D in as you can before the nine months of rain starts again. In the height of summer we’ll be several weeks out on repairs because people just didn’t prepare like they should have. Getting patching materials, cleaners, and conditioners is as easy as stopping by IBC’s store or ordering supplies online. Don’t let air and opportunity stand in the way of your boating, spend some of that income tax return and set yourself up for success in the summer. 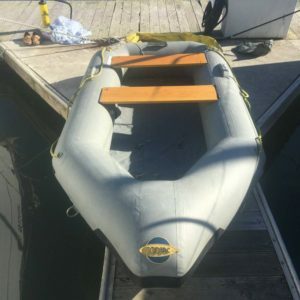 If that old boat that grandpa gave you back in 1976 is starting to look ugly sell it for $500 bucks on Craigslist like the one pictured in Sausalito above and get your new one ordered for the season opener. If you’re like us at all you’ve already had several boating adventures this year already and are just marking time until the sun comes and shows it’s face.